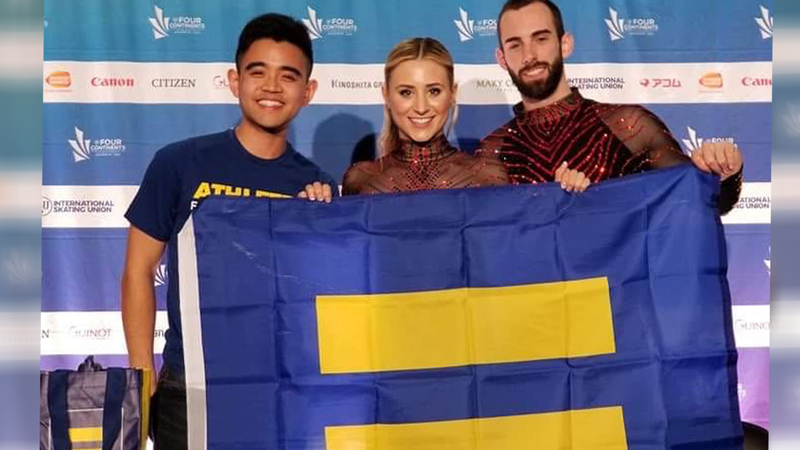 Recently, HRC sat down with Timothy LeDuc and Ashley Cain, 2019 U.S. National Champions in pair skating, to talk about equity, queer excellence and rising from the ashes. LeDuc made history when he became the first openly queer person to win a national championship in pair skating. He hopes that his journey inspires other LGBTQ people to live authentically. The pair competes next in the ISU World Championships this week in Saitama, Japan. Here are five things to know about LeDuc. 1. He first realized that he was gay when reading a book about figure skating. Until then, he always knew that he was different, and remembers feeling alone and anxious because he had never met another gay person and had no one to talk to. That’s one of the reasons he wants to be a visible LGBTQ role model -- so that other young people know that they are not alone. 2. He wants to make it clear that he is a queer skater. LeDuc said that some people try to “straight-wash him or separate my identity as a skater and as a person,” noting that fans sometimes ask him why his sexuality matters when it comes to skating. He says it’s important that the world understands that what he does on the ice is queer excellence. 3. He looks up to LGBTQ athletes including Rudy Galindo, Eric Radford and Chris Mosier. LeDuc’s queer role models are ice skaters Galindo and Radford, as well as triathlete Chris Mosier. He actually ran into Mosier at the US Olympic Training Center, but was too starstruck to introduce himself to the transgender trailblazer. 4. He recommends the book “White Fragility” by Robin DiAngelo. LeDuc emphasized the importance of “never feeling that (you’ve) arrived at a destination of enlightenment” when it comes to social justice and inclusion work. He strongly believes that learning is an ongoing and lifelong process, and that being humble and open to the experiences of other people is the best way to foster empathy. Acknowledging his privileges, LeDuc said that self-examination and doing the work to understand the effects of systemic racism, colonialism, misogyny and other forms of oppression are critical to moving equity forward. 5. He wants his legacy to be about overcoming adversity.